On Friday, October 23 from 1:00 to 5:00 PM (the day before our Annual Banquet), Vic Fleischer, director of the University of Akron Archival Services, cordially invites you to view high-quality videos newly made from original 35 mm nitrate films preserved in the university’s Goodyear Tire & Rubber Company Collection. 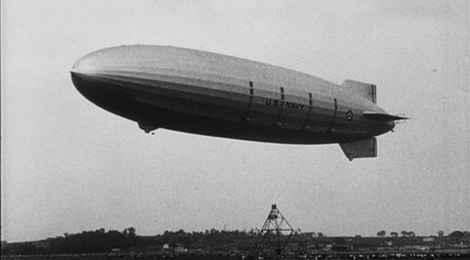 The continuous showing of three Goodyear educational films showcasing the USS Akron will be in Room LL10, The Polsky Building, 225 S. Main St., Akron (entrance on the building’s east side, on High St.). Parking is available one-and-a-half blocks west at 52 W. State St., behind the former O’Neil’s building and immediately north of Canal Park. Refreshments will be served. For further details, call 330-972-7670. This entry was posted in Airships, Dirigible, History, Movies, Rigid airship and tagged Airdock, airship, Akron, dirigible, goodyear, Navy Day, U Akron Archival Services, University of Akron, USS Akron. Bookmark the permalink.